The largest of all the Cascade lakes, beautiful Wickiup Reservoir is located southwest of Bend, surrounded by the towering pines of the Deschutes National Forest. Oregon’s second largest reservoir, and the largest Cascade lake, covering over 10,300 acres. Beautiful scenery and trophy-size brown trout attract anglers. Set up camp at one of six different campgrounds near the lake and enjoy the fresh mountain air. Only 40 miles southwest of Bend. 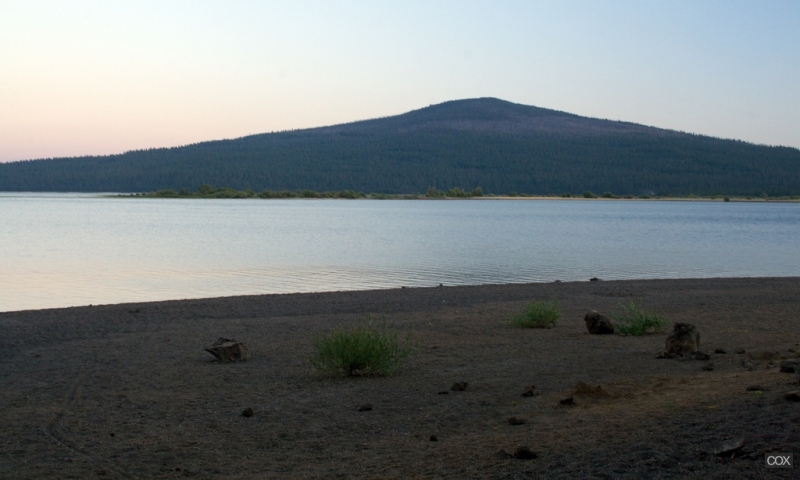 Located deep in the Deschutes National Forest southwest of Bend is Wickiup Reservoir. With a water surface of 10,334 acres, it is Oregon’s second largest reservoir and the largest Cascade lake. Surrounded by beautiful Ponderosa and lodgepole pines, the reservoir is also one of the best places in Central Oregon to view wildlife. Outdoor enthusiasts enjoy a variety of activities at Wickiup Reservoir, including camping, fishing, waterskiing, and hiking. Wickiup Reservoir, Oregon, is located about 40 miles southwest of Bend in the beautiful Cascade Range, via Hwy 97 and forest service roads. Fishing – Wickiup Reservoir has been named the best lake in Oregon for brown trout fishing. Some of the trout caught there have weighed over 20 pounds, and the average is 5 to 8 pounds. The lake also has salmon, rainbow trout, and mountain whitefish. The best fishing is via boat, although early in the season you can catch a lot from the shore. Camping – There are 6 campgrounds near Wickiup Reservoir, providing scenic spots to set up tent and enjoy the crisp mountain air. The construction of Wickiup Dam began in 1939, and was completed in 1949. The reservoir’s water surface elevation is 4,336 feet. The water levels of Wickiup Reservoir can vary a lot, causing the shoreline to change significantly as well. The reservoir is named after the “wickiup” poles the Indians once used to make a shelter when they hunted and fished in the area.